Marcus Valerius Maximianus was one of the heroes of the Marcomannic wars. He was among the successful generals who campaigned against the northern barbarians. He is also an interesting historical person for the people of Slovakia, because his life is linked with the territory and history of this modern country and one of its most important early epigraphic monument. A detailed reconstruction of the life and especially career of Maximianus was allowed by the discovery of an honorary inscription with the list of offices, which this man occupied. It was found during excavations of the Byzantine fortress in Zana in Algeria (ancient Diana Veteranorum). 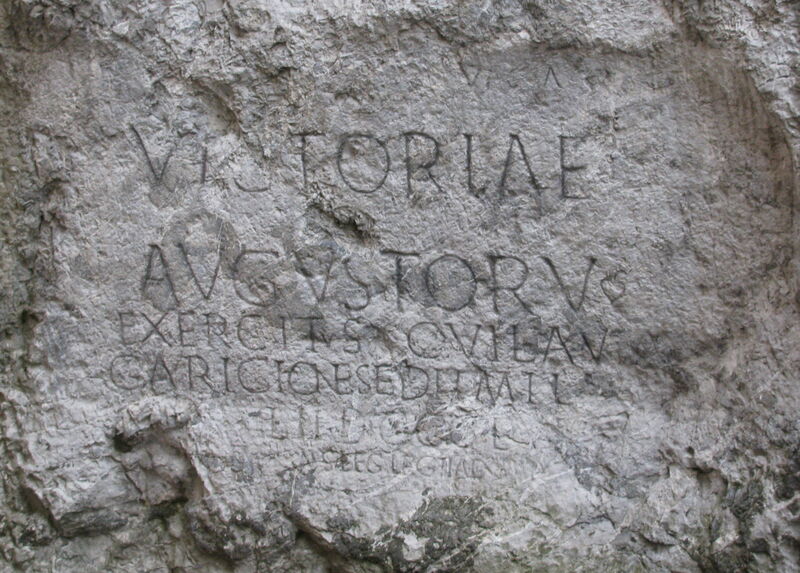 In the walls of the fortress the base of the honorary statue of Marcus Valerius Maximianus was used, which was erected by the city council of Diana Veteranorum to Maximianus (at that time the propraetor of the African province) at the beginning of 180s and into which the inscription with his career was carved. The inscription contains also the information that Maximianus was the legate of the Legion II Adiutrix and commander of the unit, which wintered in Leugaricio/Laugaricio. This important information could be connected with another inscription situated on a rock in modern Trenčín (Slovakia), which was created by a vexillation of the Legion II Adiutrix, which stayed there for some time, and on which the name Laugaricio is mentioned as well. Thanks to this it was possible to identify Maximianus as the one who looked after the making of the inscription in Trenčín (you can find Latin text and English translation of both inscriptions below). Marcus Valerius Maximianus was born in Poetovio in Pannonia (modern Ptuj, Slovenia). We do not know when exactly this happened, but with regard to his career it is possible to estimate that he was born earliest short before the year 130 and around the year 140 at the latest. He belonged to an old equestrian family and his father was a censor and priest in Poetovio. Also Maximianus exercised his first office in his home town - he was a pontifex. He started his military career as the prefect of the I. cohort of Thracians (cohors I Thracum). Then as a tribune he commanded the I. cohort of Hamians (cohors I Hamiorum civium Romanorum milliaria), which had its garrison in Syria, and later he was in charge over the coastline people in Pontus Polemoniacus, where his task was probably managing the supply of the Roman army during its campaign against Parthia, which was led by the emperor Lucius Verus (161-166). He was decorated for his command in this post. After the end of the Parthian war in 166 Maximianus did not continue his military career. It seems that he returned to his home town Poetovio for a few years. Next we hear about Maximianus in 169 or 170, when he was commissioned by the emperor Marcus Aurelius with a special tasks of ensuring the supply of the Roman army operating against barbarians in Pannonia by ferrying the supplies down the Danube river on boats and of carrying on reconnaissance operations in this area. For this mission he had at his disposal vexillations of the fleets from Misenum, Ravenna and Britain and also Moorish and African cavalry troops. Later he took command of the I. ala of Aravacans (ala I Aravacorum), which probably operated from Pannonian Arrabona (modern Györ, Hungary). During the fighting Marcus Valerius Maximianus distinguished himself really exceptionally. With his own hands he killed in battle Valao, the Germanic chieftain of the Naristae tribe. For this great achievement he was personally lauded by Marcus Aurelius himself and as a reward he received a horse, weapons and military decorations from the emperor. In 173 at the latest Maximianus was assigned command of the I. ala of lance-bearers (ala I Ulpia contariorum civium Romanorum milliaria), which also resided in Arrabona and was an important part in the defence of the province Pannonia. Serving as prefect of this ala he received additional decorations for his service in the war against Germans and Sarmatians. War on the Danube was interrupted in 175, chiefly because of the revolt of Avidius Cassius, which sprang up in the east of the empire. To face this new threat Marcus Aurelius ordered many troops to quickly march to the east. Maximianus participated in this expeditious campaign leading picked cavalry units recruited from the warriors of defeated Germanic tribes of Marcomanni, Naristae and Quadi. However, there was no battle at last. The uprising lasted only for some three months. Then Avidius Cassius was murdered and the danger vanished. After the situation calmed down Maximianus returned in 176 back to the Danubian frontier as procurator of Lower Moesia. Apart from civil duties connected with this office he assumed also military command and the task to eliminate the threat of Brisean bandits on the border with Macedonia and Thracia. It is possible that he also strived to recruit the captured Briseans into the Roman army. Two more procuratorships followed quickly one after the other - in Upper Moesia and in Dacia Porolissensis. It is obvious that especially in the last two named posts Maximianus fought actively against the Sarmatians. For his distinguished service and of course also as a result of recommendation by his powerful friends - surely especially Publius Helvius Pertinax (at that time a successful and by Marcus Aurelius much valued general and later to be Roman emperor), with whom he had become acquainted already during the Parthian campaign and under whom he then served for a long time on the Danubian front - Maximianus was probably in 178 or 179 as the first native from Pannonia admitted into the senatorial order. This was quite an exceptional affair, which was made possible by the difficult circumstances of the crisis during Marcomannic wars, and by the fact that Marcus Aurelius inclined to judging people by their accomplishments rather than by their origin and social status. The promotion to senatorial order ensured access to higher military and administrative posts for Maximianus and so we can soon see him as the legate of the Legion I Adiutrix, garrisoning Brigetio in Upper Pannonia at that time and soon later as the legate of the Legion II Adiutrix, which was stationed in Aquincum in Lower Pannonia. At the turn of 179/180 he personally led a detached unit of his II. legion, which spent winter at a place called Laugaricio or Leugaricio in the vicinity of modern Trenčín, Slovakia - ie. deep in the lands of the Germanic tribe of Quadi, some 120km from the Roman limes. This event is attested first by the Zana inscription, and second by an inscription found on a rock in Trenčín, which commemorates the winter sojourn of 855 men of the Legion II Adiutrix there. Originally the man responsible for carving of the inscription could not be established, because only the letters "IAN S" could be discerned. 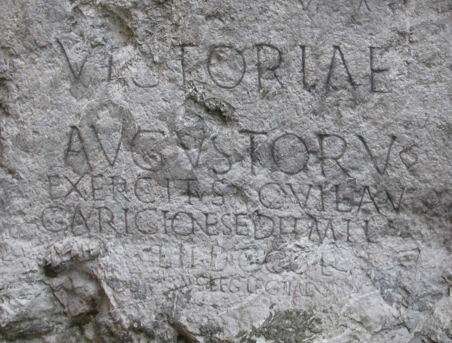 But the discovery of the monument from Zana enabled the identification of Marcus Valerius Maximianus as the man from the Trenčín inscription. Unfortunately archaeologists have not been able to locate the camp of this vexillation yet. Both inscriptions (as well as the objects from Mušov) provide interesting additional details to the testimonial of the Greek historian Cassius Dio, who wrote, that in the final phases of the Marcomannic wars many Roman troops wintered in the territories of Marcomanni and Quadi. On these inscriptions and also for example on the recently discovered Roman temporary camp in Olomouc-Neředín we can see, that legionaries advanced deep into the barbarian lands. In the following years Maximianus commanded legions V Macedonica in Potaissa in Dacia Porolissensis (modern Turda, Romania), I Italica in Novae in Lower Moesia (near Svishtov, Bulgaria) and XIII Gemina in Apulum in Dacia (modern Alba Iulia, Romania). He was already for the third time decorated for taking part in the second campaign against Germans, this time by the emperor Commodus (ie. after the death of Marcus Aurelius). Then he was transferred to Numidia, where he assumed command of the Legion III Augusta and also governorship of the province. The peak of Maximianus' career was the consulship, which he held as the suffect consul absent from Rome sometime between 183 and 185. We also know that he worshipped the eastern god Mithra, to whom he dedicated altars in Apulum and in Lambaesis (modern Lambèse, Algeria). To Marcus Valerius Maximianus, son of Marcus Valerius Maximianus who was local censor and priest, priest of the colony of Poetovio, with the public horse, prefect of the first cohort of Thracians, tribune of the first cohort of Hamians, Roman citizens, placed in charge of the coastline of the peoples of Pontus Polemonianus, decorated in the Parthian war, chosen by Emperor Marcus Antoninus Augustus and sent on active service in the German expedition with the task of bringing food by boat down the river Danube to supply the armies in both provinces of Pannonia, placed in charge of the detachments of the praetorian fleets of Misenum and also of Ravenna and also of the British fleet, and also of the African and Moorish cavalry chosen for scouting duties in Pannonia, prefect of the first ala of Aravacans, while on active service in Germany praised in public by emperor Antoninus Augustus because he had killed with his own hand Valao, chief of the Naristi, and was granted his horse, decorations, and weapons; in the same ala he achieved the honour of his fourth military post, prefect of the ala of lance-bearers, decorated in the war against the Germans and Sarmatians, placed in charge with the honour of centenarian rank of the cavalry of the peoples of the Marcomanni, Naristi, and Quadi journeying to punish the insurrection in the east (i.e. the revolt of Avidius Cassius, AD 175), with an increased salary appointed to the procuratorship of Lower Moesia and at the same time placed in charge of detachments and sent by the Emperor to drive out a band of Brisean brigands on the borders of Macedonia and Thrace, procurator of Upper Moesia, procurator of the province of Dacia Porolissensis, chosen by our most revered emperors for admission to the senatorial order among men of praetorian rank, and soon after legate of Legion I Adiutrix, also legate of Legion II Adiutrix, placed in charge of the detachments in winter quarters at Laugaricio, also legate of Legion V Macedonica, also legate of Legion I Italica, also legate of Legion XIII Gemina, also legate of the Emperor with propraetorian power of [Legion III Augusta], decorated by the most noble Emperor Marcus Aurelius Commodus Augustus on the second German expedition; the most distinguished council of the people of Diana Veteranorum (set this up) with the money contributed. The history of the inscription from Trenčín is quite interesting. It was known probably already in the 17th century and may be even earlier. However, as the access to the inscription was difficult (because of a river which flew right at the bottom of the rock and because of willows and later poplars in front of it) it was almost totally forgotten. Only in 1852 a storm uprooted a poplar, which was concealing the rock, and the inscription was discovered again. First attempt to decipher the inscription was made by Ludvík Stárek, a canon and dean in Trenčín, but he was not very successful. In spite of that his report and proposed reading of the inscription made it to Theodor Mommsen, the editor of the great collection of Latin inscriptions of the Roman empire known as the Corpus Inscriptionum Latinarum (CIL). Nevertheless due to incompetent reading of the inscription by Ludvík Stárek Mommsen placed the inscription from Trenčín among forgeries in CIL. Fortunately the inscription was later seen by a renown Hungarian archaeologist Joseph Hampel, who thought that it could after all be authentic. He created plaster cast of the inscription and sent it to Theodor Mommsen, the greatest Latin epigraphy expert of that time. Theodor Mommsen together with another scholar Otto Hirschfeld now examined the inscription directly. When seeing the actual inscription personally Theodor Mommsen realised that his previous judgement of the inscription as forgery was incorrect and it really is authentic. In 1902 the inscription from Trenčín was finally added to the Corpus Inscriptionum Latinarum in a new Mommsen's reading, this time as authentic. During further examination of the information from the inscription it has been proposed (based on the similarity of the two names), that Laugaricio/Leugaricio can perhaps be identified as the trade settlement called Leukaristos, which is mentioned in the work Geografia written by the Greek geographer Claudius Ptolemaius. Although we cannot exclude this hypothesis, it was questioned with the suggestion that Leukaristos may have been located rather more to the north, perhaps in the area of modern Poland. Weather conditions, rainwater and other environmental agents have negative effect on the inscription's condition. Some parts of the inscription, which were clearly visible and readable in the past, are now damaged or totally illegible. Therefore several restorations have already been undertaken. During the restoration in 2001 two new letters were discovered to the right over the first line of the inscription (over IAE letters in the word VICTORIAE). They are authentic and clearly belong to the inscription. The letters V and A can be seen and there is a lacuna between them large enough for three additional letters which, however, are not readable today (the second one may perhaps be I) and therefore a better interpretation of the new text is unfortunately not possible. Alföldy, G.: P. Helvius Pertinax und M. Valerius Maximianus, Situla 14/15, 1974, p. 199–215. Campbell, B.: The Roman Army: A Sourcebook, London/New York, 1994. Dobiáš, J.: Dva příspěvky k topografii válek markomanských a kvádských, ČČH 27, 1921, p. 135–156. Dobiáš, J.: Nový nápis ze Zany (Diana veteranorum) a římský nápis na skále trenčínské (CIL III 13439 = Dessau, ILS 9122), LF 5(80), 1957, p. 179–196. Dobiáš, J.: Nový pramen k dějinám markomanských válek na našem území, AR 9, 1957, p. 523–534. Hošek, R.: M. Valerius Maximianus im unteren Donauraum in den Jahren 176–178 U. Z., SPFFBU 8, 1959, p. 83–92. Lunzer, D. von: Valerius 236, RE VIII A 1, 1955, col. 86–90. Nešporová, T.: Poznámky k súčasnému stavu rímskeho nápisu v Trenčíne, ZbSNM 99-Archeologia 15, 2006, p. 55–62. Nešporová, T. – Rajtár, J.: Laugaricio: Trenčín a okolie v rímskej dobe, Pamiatky a múzeá 3, 2000, p. 30–33. Pflaum, H.-G.: Sur les guerres du Danube à l'époque de Marc Aurèle, d' après une inscription récemment découverte de Diana Veteranorum en Numidie, Comptes-rendus des séances de l'Académie des inscriptions et belles-lettres 100/1, 1956, p. 19–23. Prikryl, L. V.: Leukaristos (Laugaricio) v diele Klaudia Ptolemaia, in: Laugaricio, Trenčín, 1980, p. 27–35. Szászová, H.: Trenčiansky rímsky nápis vo vedeckej a populárno-vedeckej literatúre, in: Laugaricio, Trenčín, 1980, p. 13–25.